Not too long ago, soon-to-be newlywed couples would register for beautiful tableware – crockery, stemware and cutlery – as part of setting up a new home together. The once popular rite of passage has all but died off, as has a general understanding of what constitutes fine tableware. From the key quality indicators to how to make sense of interchangeable terms, this guide will offer you all the information you need for collecting, caring for and storing your tableware. Ceramic is the general term for all wares made from a clay-based mixture and hardened by heat. Within the world of ceramics, however, there are numerous categories of varying qualities and characteristics. The three main ceramic categories are: stoneware, earthenware and porcelain. Earthenware and stoneware are certainly the more ordinary of the three but although both are opaque (porcelain is translucent), there are some differences to be aware of. Stoneware is harder, stronger, extremely durable and more temperature-resistant than earthenware and, as such, is often used for kitchen items, such as casserole and oven dishes. It is usually much heavier than earthenware and when chipped will appear dark and gritty inside. Sometimes used for utilitarian dinnerware, earthenware is a less precious alternative to porcelain. It can be decorative like porcelain (although not of a fine quality) and when chipped will appear white and chalky. Many cultures are well known for the decorative earthenwares they produce such as tagines and terracotta pots. 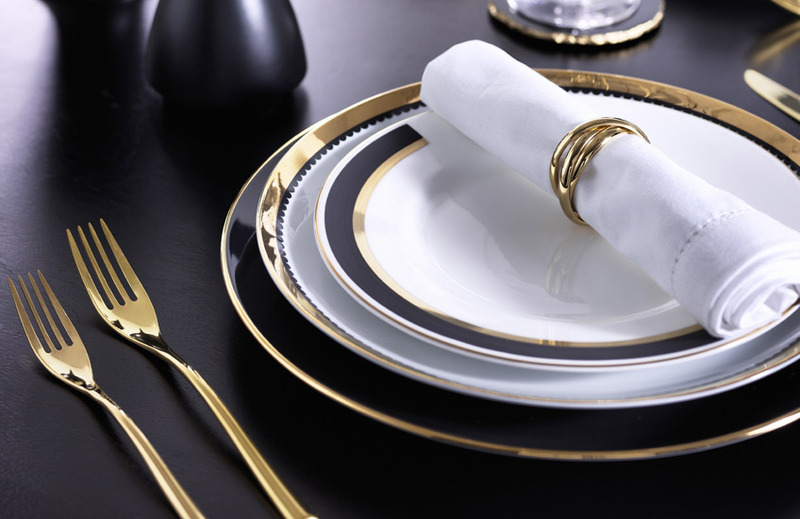 When it comes to luxury crockery, the only options to consider are certainly porcelain or bone china, but even these two and their qualities can vary widely. Hard-paste or true porcelain is distinguishable by the use of kaolin (or China clay) in its composition, along with feldspathic rock. Having been first produced in China (hence its alternate moniker) in the 7th and 8th centuries, it was finally introduced in Europe around 1709. Due to its translucency and delicacy (it can be made to be very thin), porcelain is highly valued and sought after. It is also non-porous making it suitable for food and dining use. Soft-paste porcelain first appeared in Europe in 16th century Florence as Europeans attempted to discover the secret of the East’s designs by adding extra components such as powdered glass. The most desirable soft-paste porcelain to be created was fine bone china which originated in Britain in the 18th century. Fine bone china is now produced by mixing hard-paste porcelain with bone ash. (The quality of bone china is dependent on how much bone ash is included in its composition. Nothing less than 30% bone ash should be accepted.) Because of its durability – the result of a combination of hardness and density – bone china is often chosen for luxury table services. The addition of bone ash also produces its characteristically creamy white hue. Both hard and soft-paste porcelain are fired at much higher temperatures than stoneware and earthenware giving them their translucent qualities. Special or decorative finishes can be either underglaze or overglaze. Underglaze refers to designs in which the pattern and colours are protected underneath by a glaze. Overglaze refers to pieces which are painted or embellished on top of the glaze. Different glazes are fired at different temperatures and this, more than anything else, should determine how a dinnerware service should be cared for (see below). Fine crockery should never be treated in the same manner as everyday crockery and one should always be sure to read the accompanying instructions before use. Always remove any food or liquid from the plate as soon as possible by running under the tap and wiping with a soft cleaning cloth to prevent it sticking. “Fine porcelain is very solid. It is ok [to use] the dishwasher as long as it is not for a daily use,” Marie suggests, “In fact, we are working with restaurants which [put] them in machines regularly but they use professional machines with nearly no powder. Good advice is to put very little washing liquid [in] – better than powder and tablets which are very bad! On the whole, hand washing will always be the safest option for such delicate items but, as suggested, in some cases dishwashers may be appropriate. When considering the use of a dishwasher, bear in mind the glazes of each piece. Underglaze designs can be suitably washed in the dishwasher whereas overglaze designs should not be. Any designs with precious metal rims should also never be used in the microwave. The most suitable way to store dish ware is to stack with a napkin placed in between each plate. Do not slide plates over each other as this may mark the glaze. For stemware, Richard Brendon advises: “Do not store your crystal glasses upside-down – the lip of the glass is delicate and may be damaged under the weight of the glass.” Crystal should also never be exposed to extreme temperatures. Flatware, silverware, cutlery – the names are numerable, as are the distinctions between their materials. Equally important to your tablescape, flatware and serveware come in a variety of options which should be carefully considered. Stainless steel cutlery is a popular choice for everyday dining for today’s modern lifestyle due to its resiliency (including resistance to scratching) however, it should be noted, that it is much heavier than finer cutlery. Usually either a silver or gold plate, plated cutlery is crafted of stainless steel or nickel before being immersed in a plating vat. Through electrolysis, particles of the precious metal bond to the piece, depositing a thin layer. The quality of the plating can be determined by its thickness which is measured in microns. One millimetre of plating is made up of 1000 microns. 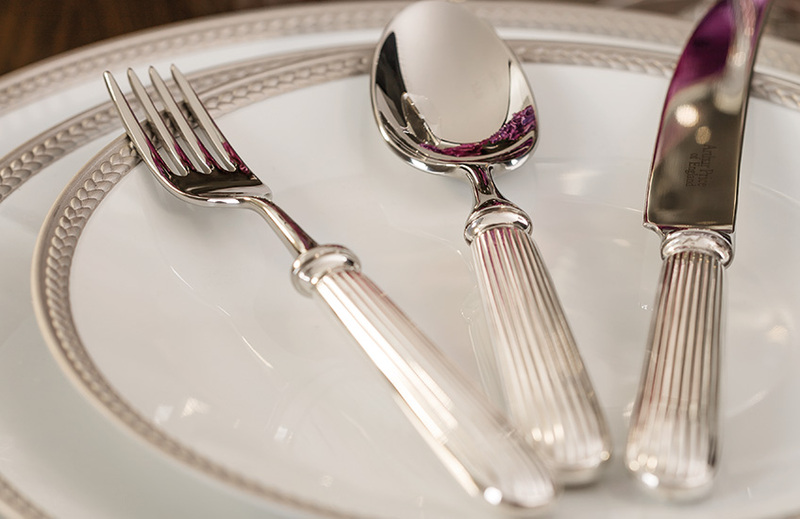 Sterling silver cutlery is undoubtedly the finest flatware being much more lustrous and lighter than stainless steel and, therefore, it is the most expensive. Sterling silver contains 92.5% silver and 7.5% of another metal – this addition makes it stronger for utilitarian use. It will tarnish over time if not used so careful care is required during its lifetime. Rinse cutlery as soon as possible to prevent natural sulphurs (such as broccoli, fish and eggs) from affecting the finishes and refrain from using washing detergents which contain lemon. Salt will corrode silver cutlery over time so make sure to empty all salt shakers or cellars in between uses. Wedgwood suggests wiping sterling silver with a soft, dry cloth: “Do not use polishes or cleaners which may affect the coating. Do not allow to soak in water and dry fully before storing.” The V&A also warn against home remedies, particularly those containing ammonia, which “usually rely on harsh abrasives, acids or alkalis to attack tarnish”. Gold or silver-plated cutlery should be treated in like manner although even more carefully as plated layers are thin and could be worn away as a result of vigorous cleaning. Store special silverware carefully by wrapping your utensils in acid-free tissue to prevent discolouration. Do not wrap in plastic which retains moisture and leads to tarnishing. A 100% cotton silverware storage roll in a wooden container with protective lining or a cutlery cabinet are ideal. Include a silica gel packet to soak up any moisture. Do not store fine cutlery in a utensils drawer and, if storing together, without wrapping each piece up individually. Stainless steel will not tarnish and can be washed in the dishwasher but should still be stored correctly to prevent unnecessary scratching.